A mesmerizing collection of twenty-seven uniquely formed bones, three sensory and motor nerves, and an opposable thumb, the hand represents one of the most fragile and powerful tools of the human body. Dr. Maria Montessori, aware of the very important link between perceiving, touching, and understanding once called the hand “the tool of the mind”, activated by our nervous system and intentionally designed to send signals to and from our sensorial parts of the brain to solidify facts and identify patterns. 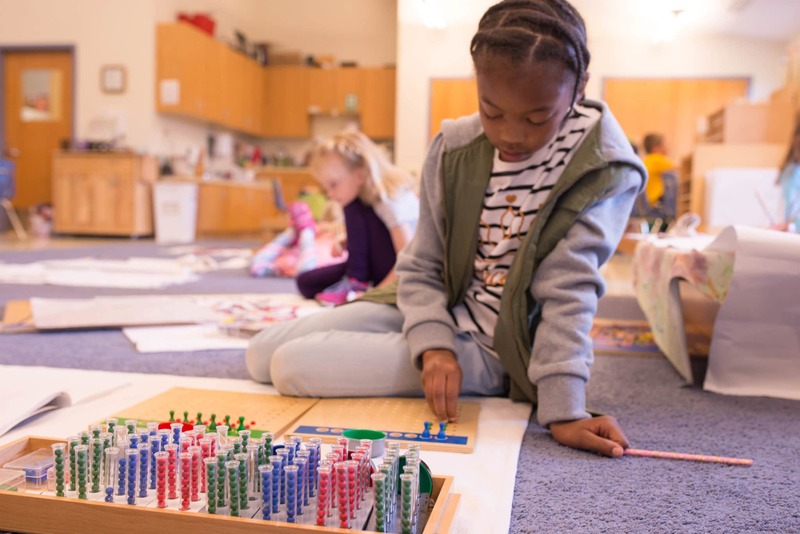 Although art and music are often thought to be the most “hands-on” forms of learning in classrooms, the Montessori approach believes that math offers one of the richest opportunities to make connections between the hands, the brain, and the numbers that make up the world around us. 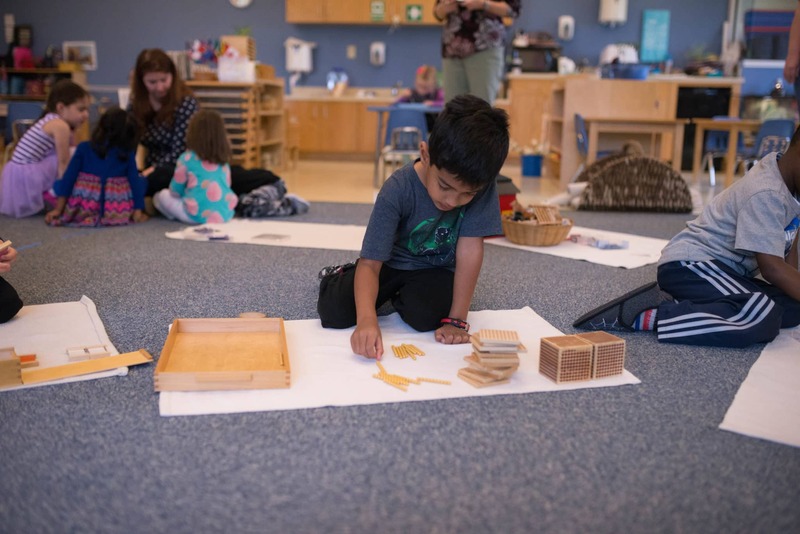 As Dr. Montessori theorized, the connection between brain development and motor skills both impact children’s ability to understand concepts at different ages, moving from the abstract to the concrete over time. 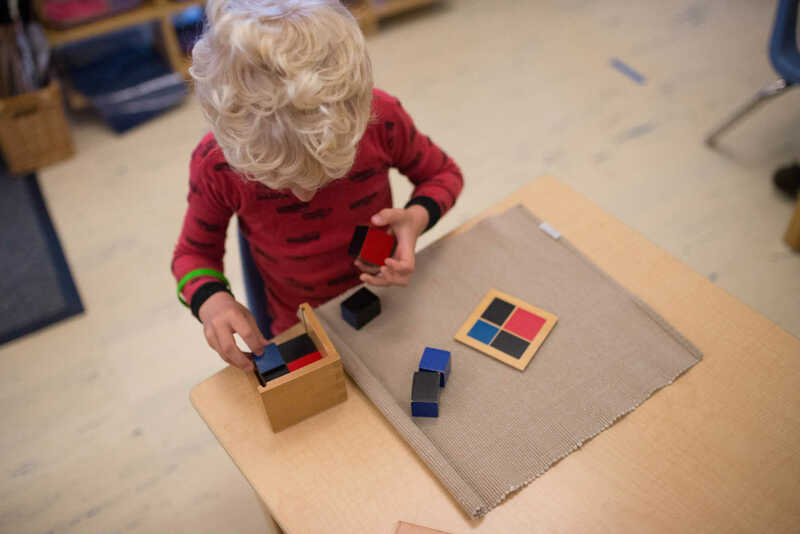 Before the age of 10, Dr. Montessori felt that children needed to work with mathematics in a concrete, physical, and highly tangible way in order to understand their basic functions. She believed that this tactile learning style, a radical approach compared to the rote pen-to-paper drills and memorization that most children learned through, gave children the ability to understand concepts in the physical sense, so that they may understand them in more abstract ones. As children mature, they become more attuned to abstract perception, therefore able to ‘fill in the blanks’ of their comprehension and solve in ways that they couldn’t at a younger age. In pre-school, our most important goal is to help children ‘feel their way’ around the numbers they’re going to be working with in the coming years. 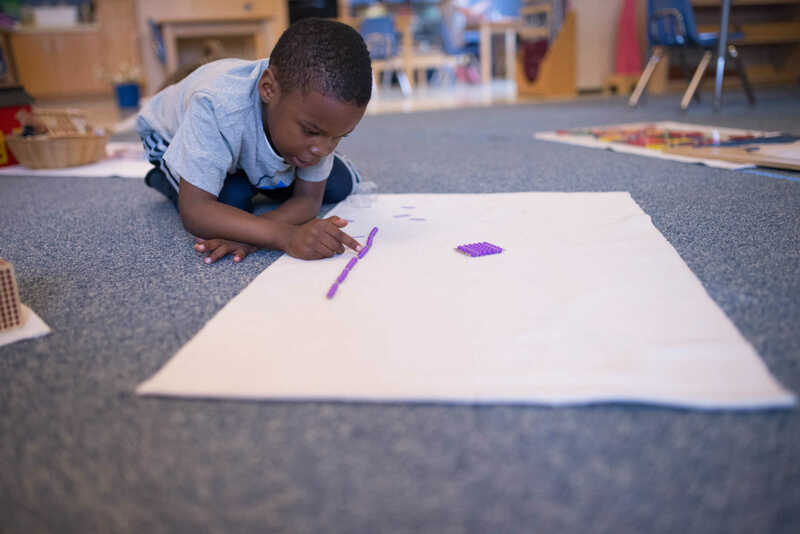 The work students typically interact with at the Pre-School stage includes exercises that introduce shapes, size, weight, patterns, and similarities, leading children to independently discern and identify materials through each of the five senses. In the process of touching and feeling, being asked the names of certain pieces, and organizing work, children come to understand, identify, associate numbers with their behaviors, building pathways from their physical experience into mental modes of thinking that they will later recall when introduced to more advanced work using the same numbers. 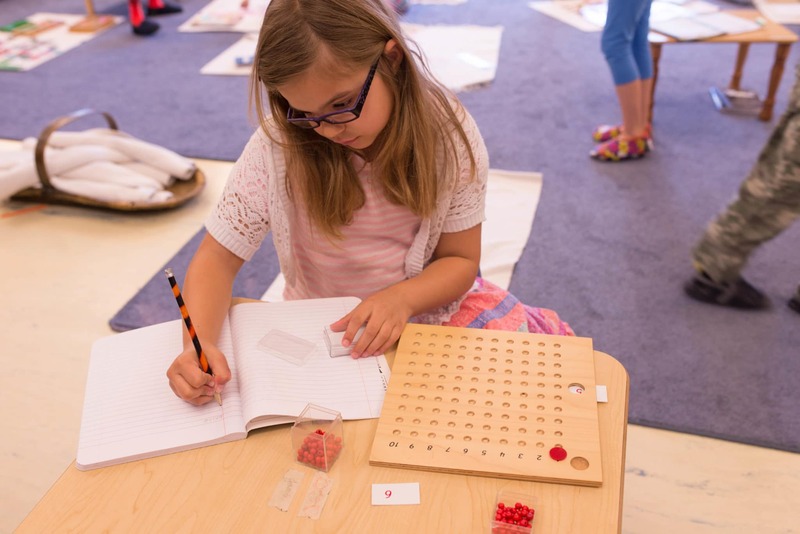 The first math material that is presented to children is called the Number Rods, a uniquely Montessori learning tool. These are ten rods alternately painted red and blue. The first rod is red, representing the idea of ‘1’. The second is twice as long, painted half red and half blue. The third rod is three times as long as the first, painted red, blue, and red. The rods continue like this through the number 10, the longest and most colorfully painted rod of the group. Children use these rods in a number of different exercises, building them in ascending stairs to understand how the numbers rise, counting them out loud when asked for a certain number, and verbally demonstrating the differences between two rods to gain greater familiarity of the relationships between numbers. Once children have gained a concrete understanding of quantity and sequence from working with Number Rods, we then move on to concrete numerals for numbers 1-10. Since children have been working with these numbers already in their physical form, making the switch to calling them by their numeral form is a subtle but important change. The numbers we present are represented as sandpaper with a wood backing, used to help children learn the numbers through a variety of senses. After these concepts are taught in isolation, we merge them so that children understands that a given numeral, such as ‘2’, actually represents a certain quantity, with a certain name, and a certain symbol. We proceed through a series of exercises that reinforce and build on this concept, before moving to more advanced counting and the decimal system. In Children’s House at Chesapeake Montessori School, we introduce concepts of math to children early on, focusing on beginning and advanced counting, the decimal system, identification of money, a primer to fractions, graphing, and the four operations (add, subtract, multiply, divide). The concrete work that is presented between the ages of 3-12 are designed to culminate in a firmer grasp of concepts over time, ultimately leading to math literacy. 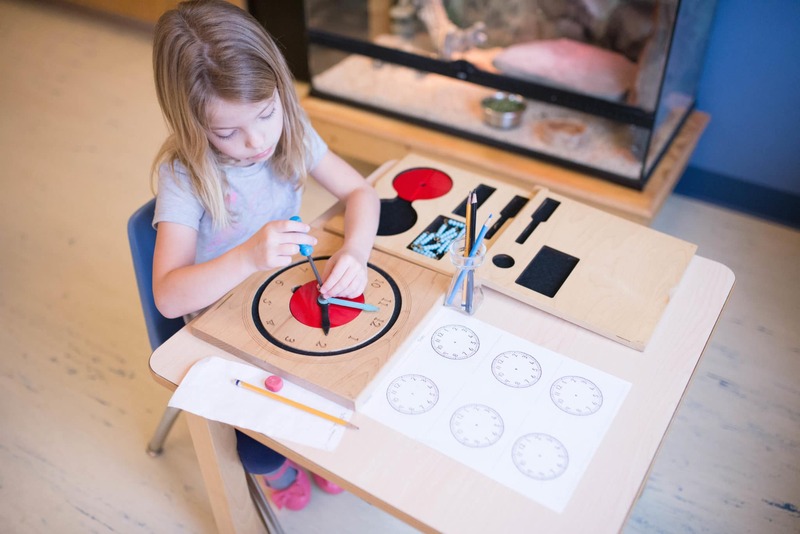 By the Elementary years, the work is focused on abstract ideas about how numbers behave, including calculating and memorizing, properties, telling time, Roman numerals, rounding, estimation, decimals, measurement, proportions, exponents, and even extensive geometry. There are many materials we use that repeat these concepts and invite a variety of other topics children are learning about at this age. Students learn the decimal system by first gaining a firm understanding on quantity. We do this by presenting a variety of work, including beads and cubes to represent units. Students also learn to name individual categories, such as units, tens, hundreds, and thousands. 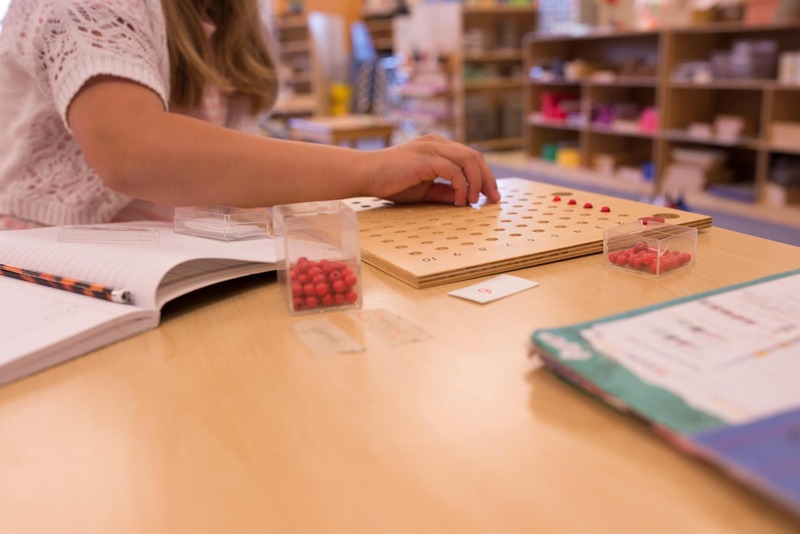 The work students do in seeing, understanding, and handling the physical numbers themselves helps them show relationships between categories, helps them visualize the sizes of these categories, and count categories aloud. Teachers will often ask students to hand them hundreds, hold the thousands, or point to the tens. To make things challenging, we’ll ask children to close their eyes, mix up the categories, and ask to name them. To help students understand how large numbers interact, we use a series of materials that become increasingly abstract over time until they use pencil and paper to solve. By the time children move to Upper Elementary, they’re able to solve long division and long multiplication problems on paper, later moving into multiples and factors. 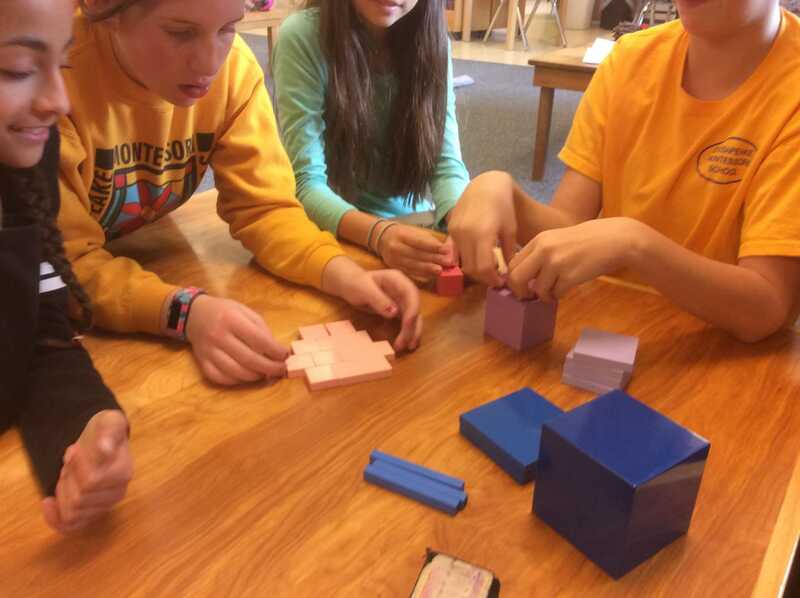 By the end of the 6th Grade, children are able to manipulate Cube Root. One type of work that Upper Elementary children find really exciting is the move from a Cube to a Non-Successive Cube. 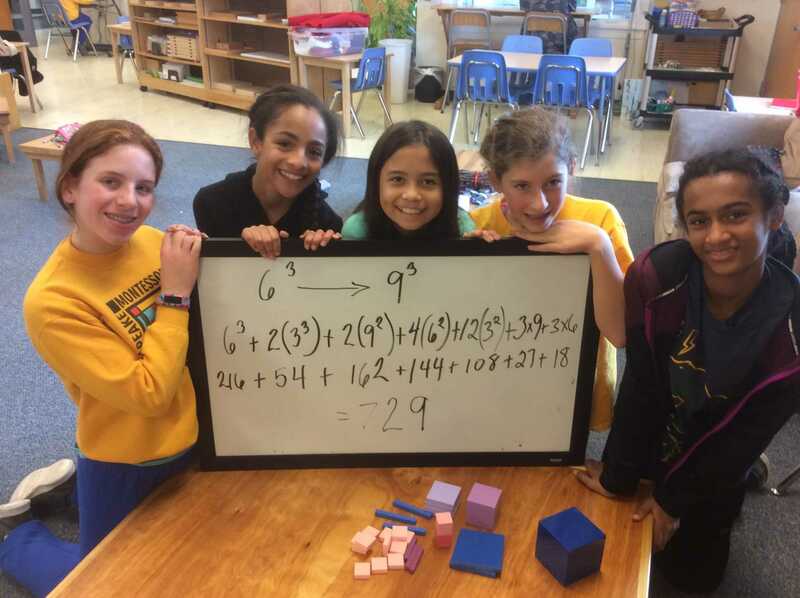 In Lower Elementary, students interact mainly with two dimensions, but in Upper Elementary, the fun really begins with an introduction to the three-dimensions. Let’s say, for example, we’re building 6 cubed, or 6 to the third power. Children make the cube by using any combination of cubes, rods, and squares to equal 216. We can then figure out how to algebraically or mathematically go from 216 to a successive or a non-successive cube. In our Children’s House and Elementary programs, teachers report to parents through report cards, individual progress reports, and face-to-face parent conferences. Early on, we have a system of evaluation that does not include traditional letter grades, using words such as proficient, satisfactory, and having difficulty. The written reports we send home to parents provide a lengthy, personal narrative as to how each student is doing in each area of the mathematics work. In Upper Elementary, we move into grading on a 100-point scale, which we feel helps children and parents understand how the student is doing. This also helps children understand their own accountability in their academic assignments, and how complete or incomplete homework contributes to a higher or lower grade. Teachers also work closely with parents through the school year, sending home reports and scheduling conferences with parents to give updates. At all academic levels, we offer two nights a year in which parents can come into the classroom and be shown the work their child works with on a regular basis. Math is always a favorite to show parents, as it breaks the mold for how adults have typically been taught to learn about the physical and abstract relationship between numbers, and helps them talk about math at with children the same way children talk about math at school.